I ordered this in hopes my sons two cats would stop using my furniture to climb on and sharpen their claws. It worked! We weren’t even finished putting it together when the started climbing. 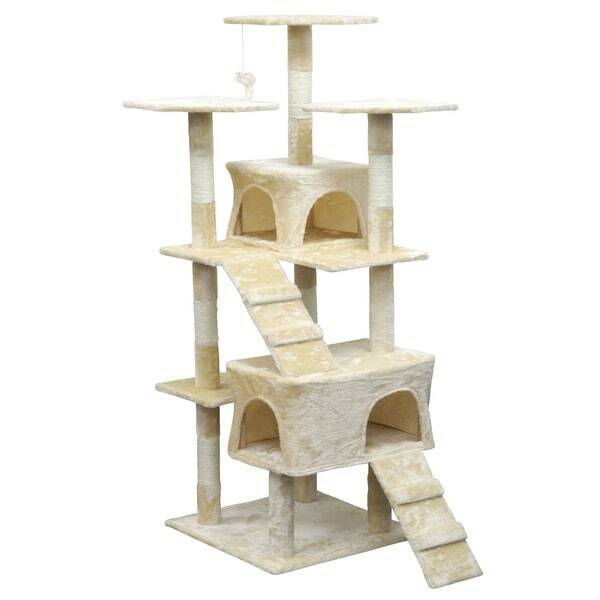 Plush and playful, this palatial cat tree is the perfect gift for any feline family members. Featuring two cat condos, ramps with steps and three perches, this entertaining unit has everything your beloved pets need to stay happy, healthy, and engaged. Show your feline family members just how much they mean to you when you give them their own space with this delightful cat tree. Well ... it does it's job? The princess of our house didn't have a cat tree yet, and that was a problem. I purchase this for her, and when it got here, I realized it wasn't exactly well made, but I wasn't expecting it to be the best cat tree ever at the price I paid for it. None of it is really secure, the top platforms teeter whenever she gets on them, and she's not even a big cat. Velcro holds some of the parts together, which is way cheaper than I thought it would be. Her favorite part though, is the toy that they stapled to the underside of one of the platforms. It seems like an afterthought to me, but she attacks it all the time. So far it hasn't fallen apart yet, but my hopes aren't high for it's longevity. My cats love this cat condo. They jump all over it. Cats love it! They were playing on it before I finished putting it together. 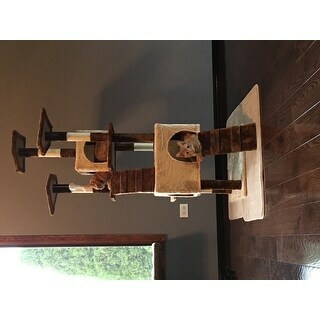 It has tough sisal scratching posts and soft nap areas. It keeps them off my furniture and they naturally like the heighth. I like it. It is sturdy if you make sure to put the bolts in tightly and soft. But it is to small for my cats. Looks bigger in the picture. However, I don't want to take it all apart, try to fit it in back in the box and return it. Too much hassle. So, I am going to order another one and bridge them with some diy ramps and carpet. Actually when I am finished I will post a picture if I can. My cats absolutely loves their cat tree! It was super easy to assemble also. It’s been a year since our purchase and it is still in good condition. Bought this for my daughters cat. The top is a bit wobbly, but overall it's nice. My cats enjoy climbing this tree, but it gets wobbly very quickly. The posts have to be tightened often. Perfect for lightweight cats or kittens, but precarious for chubby kitties. My two adult cats really like it. Good value with the two cubby holes. Easy enough to put together. My younger cat loves it!! After about 6 months the screws are starting to get loose, so it's more wobbly than it was, and once it is all put together, it's difficult to get at those screws 😞. But it was cheap enough for how huge it is!! This cat tree quickly fell apart. Surdy, easy to assemble. The problem is there really isn't space for an adult cat to lie down. The platforms are very small. Very easy to put together. While I was putting it together, my kittens were already climbing on it! They love it! Ok assembly was easy, and the cats loved it. Between all the farm cat's and kittens they used it as their house. But now the down side. Core of posts is plastic so eventually the cat's jumping on and off started quickly wearing the plastic till finally the nut pops out. I did add brackets to strengthen them to make it last a bit longer. It comes flatpack and takes a little while to assemble but it's holding up well, is easy to vacuum clean, and the cats seem to enjoy it. I had purchased a cat condo from Overstocked about 10 years ago and it's time to replace it. Not because there's anything wrong with it structure wise, it's getting thread bear! It's a very well made item and I'm looking forward to getting my new one. "Does it come built?or do you have to build it"